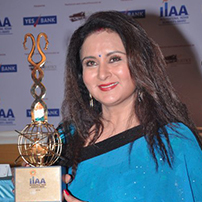 Poonam Dhillon (born 18 April 1962) is an Indian Hindi film, theatre and TV actress. A former Femina Miss India (1977), Dhillon has acted in over 80 films. She is best known for her 1979 film Noorie, for her six films with Rajesh Khanna; Red Rose, Dard, Nishaan, Zamana (1985 film), Awam (from 1980 to 1987) and Jai Shiv Shankar (1990) and other films; Romance (1983), Sohni Mahiwal (1984), Teri Meharbaniyan (1985)Samundar (1986), Saveray Wali Gaadi (1986), Karma (1986), Naam (1986), Maalamaal (1988) etc.